We have moved up the start time to Noon! The Renegade Craft Fair will be held Saturday and Sunday, July 12th and 13th. It runs from 11am to 7pm in Fort Mason Center’s Festival Pavilion. It isn’t an official part of Mechanicrawl, but it is free and close by and since it starts earlier in the day so you can easily do both! Join San Francisco Maritime National Historical Park’s Living History players in reenactment of the 1901 waterfront strike. From July 13 to October 2, 1901, San Francisco’s waterfront was shut down by sailors, longshoremen, and teamsters striking for better pay and working conditions. Experience the sights and sounds of SF history through a reenactment. 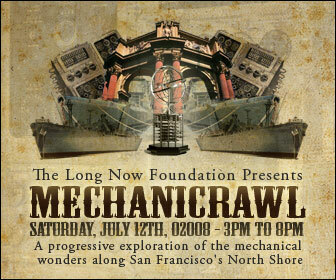 Yes, this is going on in the same area as Mechanicrawl – what fun… Show times at noon and 3pm on Saturday July 12 at the Hyde Street Pier. Just when you though there couldn’t be more – as Mechanicrawl wraps up, the doors open at Fort Mason’s Herbst Pavilion for the the first ever all women’s flat track roller derby bout in San Francisco! Doors at 7 pm, Derby at 8 pm, advance tickets available.